Robert Lovett is best known for paintings of outback Australia, many featuring horses and cattle. Robert Lovett started as a commercial artist and soon found a natural flair for landscape painting in watercolour and oil. 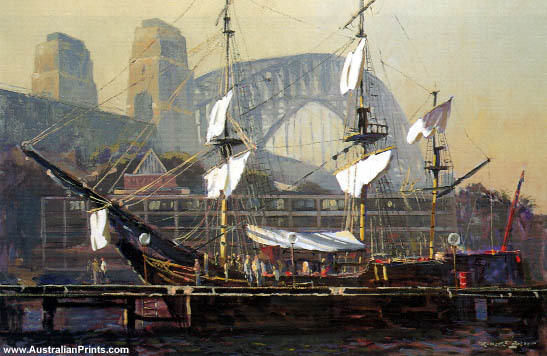 He is best known for paintings of outback Australia, many featuring horses and cattle. As official artist to the Snowy Mountains Authority from 1950 to 1968 he brought to life the rugged beauty of Australia’s ” High Country”. Robert paints mostly Australian themes but also works overseas. The Australian Government has presented forty Lovett paintings to visiting heads of state from many countries and his ability as an artist of Australian landscapes has gained world recognition. In 1993 an exclusive gallery of his work was opened on the Gold Coast. Artist information page for Robert Lovett.